Imagine a soft intimate atmosphere, in which technical perfection is capable of offering suggestions that satisfy the most exacting palates. We are listening to Ella Fitzgerald, accompanied by the guitar of Joe Pass, while she sings the "Sophisticated Lady" written by Duke Ellington. She is a charming sophisticated lady, exhibiting the refined elegance that is capable of enticing, of generating emotions and of creating passions. 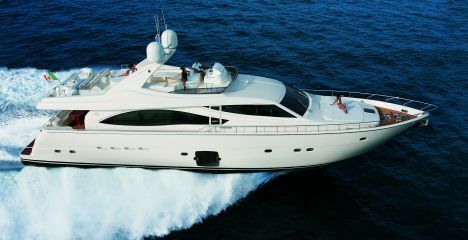 And what if our raunchy "Lady" were a boat, and in particular this Ferretti 830? We are talking of a lady of the sea, appeared at the beginning of the yachting season, making her debut in Cannes, one of the most charming spots of the Mediterranean Sea, a symbol of the jet set and of beautiful women. Range with standard engines: 420 miles. This yacht has the merit of fully interpreting the essence of the Ferretti Yachts brand, by combining luxury with technique, reliability with comfort. Are we exaggerating? We do not think so. We know well Norberto Ferretti's philosophy, for whom a boat that bears his name must be perfect, with definite and performing waterlines, yet capable of offering a high level of well-being not as utmost ambition but as consolidated standard. 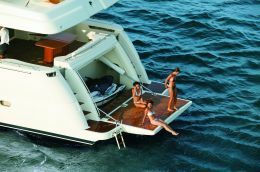 As a matter of fact, all these features are found in the Ferretti 830, a 78-foot motor yacht with flying bridge. This new model was created, as is standard practice, by the engineering department of the Ferretti Group in collaboration with the design studio Zuccon International Project. She has a lower deck - occupied by the cabins - a second covered deck plus the flying bridge. 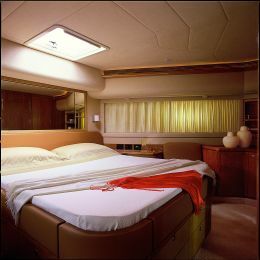 The full-beam master stateroom was given much importance, both for its size as well as for its top-quality decoration. 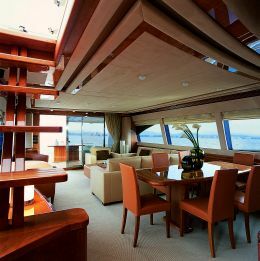 A distinct feature of this cabin and of the yacht, in general, are the ample windows on both sides, offering unquestionable brightness inside and fascinating views of the surrounding environment for those on board. This "open-view" solution is highly practical and emotionally striking and, to have the most out of it, Zuccon placed bed and furniture in such a way that, whoever is inside the cabin, may enjoy the view at all times. For this same reason, a large glass panel serves as headboard and as separating panel between the double bed and the bathroom. Thanks to this panel, which may be shaded with a venetian blind, the sea view may be enjoyed when having a shower, (the shower stall is wide enough for two), or when surrounded by the bubbles of the Jacuzzi pool (optional), a deluxe bestowal by this lady made of "composite material". The other part of the bathroom has an independent access. Two hanging lockers, a chaise longue and a vanity nearby complete this cabin's furnishings. As for the rest, the lower deck has quite a classical layout with two twin guest cabins along the central corridor leading to the VIP cabin in the bow area - with central double bed. All cabins have en suite bathrooms with marble-inlaid teak floorboards. 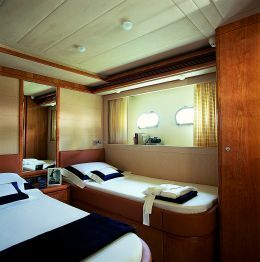 Privacy is guaranteed not only by the layout - the crew quarters are astern with access from the cockpit and the engine room separates them from the rest of the deck - but also by how furnishings and fittings are positioned as interspaces. 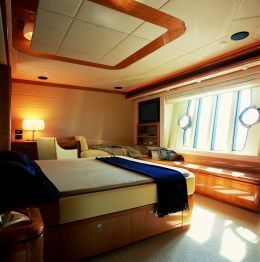 Hanging lockers, bathrooms and the fuel tanks are all along the bulkhead that separates the master stateroom from the engine room and are suitably positioned between cabins in order to dampen noise transmission from one area to the next. 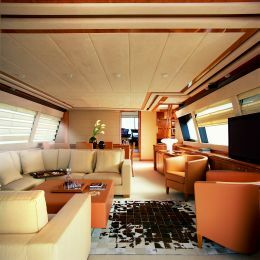 The 290-sqft salon on the main deck includes three different areas: the L-shaped sofa to port, the conversation area with the 32"-plasma TV set - concealed when not in use - to starboard and the dining room with table that seats eight forward to port, near the galley. The latter can also be also accessed from outside. To starboard, near the stairway that leads to the cabins, there is a comfortable bathroom for day use and going forward there is a dinette for two for whoever wishes to enjoy sailing near the person at the wheel. The helmsman uses a surrounding dashboard which offers rational information of all systems and also includes instruments of the Anti Rolling Gyro (ARG) system - the gyroscopic system that Mitsubishi created for Ferretti guaranteeing a 50% reduction in wave-induced rolling. Another standard "treat" fitted on this 830 is the Naviop System, the checking and managing software of the yacht's vital centers, which allows continuous monitoring and even remote control. 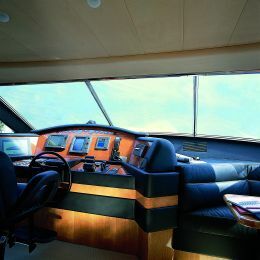 Outside, on the foredeck, there is a sunning area and astern, near the transom, there is the cockpit featuring a settee and a large dining table. The transom garage holds the jet ski. The roll bar is turned toward the bow as on most express cruisers. This fitting has an aesthetic function as well as a practical one, in fact, it protects the underlying C-shaped settee and nearby table from the hot sun. Dinette, sunning area - a foam rubber island - and helm settee follow uninterruptedly one another making the flying bridge a convivial area. Moreover, whoever wishes to enjoy whirlpool bubbles under the sun, eventually accompanied by sparkling Champagne bubbles, the Jacuzzi pool may be fitted on the flying bridge on request. Engines may be chosen from: 2x1.522hp 12V 2000 M91 MTU or 2x2.030hp 16V 2000 M91 MTU for the maximum speeds of respectively 28.5 and 33 knots.